Much has been written about the "Rideau Waterway", particularly by Robert Leggett. Most people are familiar with the wonderful stories that illuminate the system of rivers and locks that run from Ottawa via the Big Rideau to the Cataraqui. Neglected however, is the stretch from Montreal to Ottawa. Unlike the Rideau section, this part of the system receives little recognition by most people. 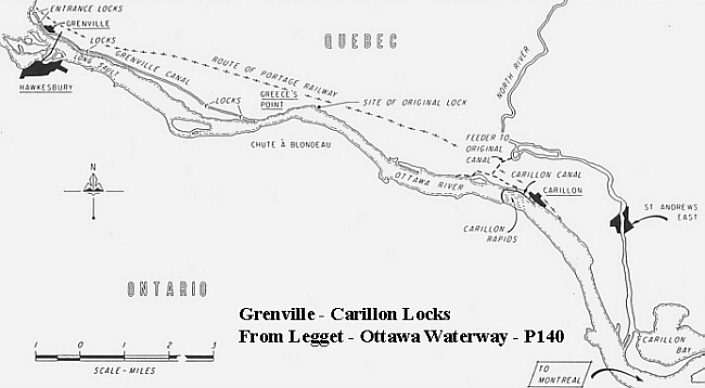 The Grenville and Carillon locks were constructed on the Ottawa River to facilitate the easy movement of vessels to and from Montreal. Begun in 1819,( before By began in 1826), these locks were as equally important and difficult to build as the Rideau Locks. The work was completed in 1834. Lieutenant Colonel By was involved in the construction here in that he personally supported the men building these locks without which his locks were irrelevant. In addition to his personal encouragement, he joined forces with the Royal Staff Corp in battling inept contractors and twisted bureaucrats. Even further downstream there are critical elements to the entire system, at Montreal. Remember that the objective was to sail from England and, with a minimum of transhipment, directly to Kingston via Ottawa. The first real obstacle was found at Ste. Anne de Bellevue. The Ste. Ann Rapids were first skirted in 1816 with a small wooden lock and later replaced by masonry in 1843. Upstream of this, the river becomes the Lake of Two Mountains. This is not a lake but rather a 12-mile stretch of river of incredibly flat landscape with few distinguishing features. Eventually, 27 miles from Ste. Anne, the Carillon Rapids are encountered. Work on circumventing this impediment began in 1829. Three locks were built lifting vessels fourteen feet. The vessels were small ocean-going craft and those barge-like vessels that sailed Lake Ontario. There was another short canal at Chute à Blondeau. A few miles upstream are the Long Sault Rapids. Preliminary research on the navigation impediment began as early as 1815. The massive undertaking involved construction of a 6-mile canal with 7 locks with a lift of 43 feet. Compare that to the 8 locks and 80 feet of lift below Parliament Hill. After these locks there was 56 miles of unimpeded waterway to Ottawa. The importance of this waterway system to the tiny village of Ottawa East cannot be understated. Yes, the canal did form the western boundary of the community and essentially isolate (and therefore preserve) a distinct group. But it also provided a major economic bonus for the businesses located to the east of Ottawa. From coal to bricks, the economy of Ottawa East was dependent on cheap transportation. The O'Dell brickyard excavated clay at the end of Springhurst Ave., fired the kilns with coal delivered via the canal which later transported the finished product to local markets and beyond. The Graham and Cain brickyards did the same. The Silicate Brick Company had a large jetty on the canal at Graham Avenue where sand was delivered from the Uplands sandpits. The Stewarton Lumber Company had a ready supply of finished lumber stacked along the banks of the canal at Echo and Main. George Barrett operated the company out of his general store just a few blocks south on Main St., at Hawthorne. And there were no bridges in the area that could handle the heavy wood and brick loads. In essence, the canal not only helped to create Ottawa East as a distinct entity, but it subsequently helped it flourish. One can only imagine the potential that has been lost with the creation of a scenic driveway!